RKVMRI was established in the year 2005 in Gujarat (India) under the patronage of Dr. Chakradhar Frend [M.Sc (Microbiology), LL.B., M.Sc (Vedic Sciences), PhD (Vedic Microbiology)]. 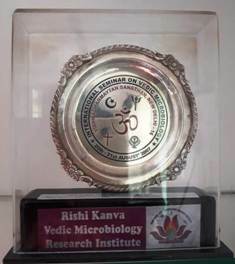 RKVMRI is an exclusive Vedic organization dedicated for research and development of Microbiological knowledge mentioned in the ancient Scientific Sanskrit texts (known as Vedic Microbiology) besides highlighting the potential of Vedic microbiology for indigenous--sustainable development and well-being. RKVMRI is affiliated to 'Vedic Virtual Vidyapeeth' (registered with Government of Gujarat), European Alliance for Innovation (Belgium), Maharshi VedVyas International Virtual Vedic University (www.e-vedicuniversity.com) since 2013. RKVMRI Endeavor: 1) To find out the degree of microbiological knowledge existent in the ancient Sanskrit and other non-Sanskrit Indian languages/ texts; 2) Collection of microbiological terminologies, verses (Slokas) in Sanskrit and its Hindi & English translation; 3) Evolving out how Vedic Microbiology can further assist for studies in Vedic-Ayurvedic and Modern life sciences-Microbiology-Biotechnology; 4) To evaluate the potential of Vedic Microbiology in giving new dimension to Ayurveda (role of Vedic microbiology in ‘marketing’ the Ayurveda in India and abroad), and 5) Identifying the Veda-Ayurveda prescribed antimicrobial agents and immuno-modulators to curb multiple / extensively drug resistant microorganisms. INTERNATIONAL SEMINAR ON VEDIC MICROBIOLOGY (2007, New Delhi) : In this first ever historic conference held in New Delhi on 20th and 21st August 2007, experts from various fields have asserted that Vedic Microbiology has huge potential to brush aside the negative side of modern microbiology. PhD (VTK) or any PhD in Vedic Microbiology. 10+ years of experience in the field of Vedas / Vedic Sciences / Sanskrit / Tantra etc. Candidate should deposit course fees in the bank account of MVIVVU (details mentioned in ‘Payment detail’). DOCUMENTS REQUIRED : scan copy of filled up registration form along with original scan copy of marksheets/ certificates / credentials + Photo. For some courses no documents is essential. On completion of enrolment process, Candidate's profile will be created on virtual platform and userid + password is issued. FEES & PAYMENT DETAILs: ONLINE BANKING (IMPS, NEFT, RTGS etc). Each session starts with the admission of student(s). This is called one-on-one—Session open throughout the year. This is win-win situation both for an aspirants and University. Open Arm acceptance for all (Amateurs & Professionals) 24x7 days.